This one is from the just opened Hash House a GoGo here in Plano TX. It seemed a little dry when I had the first half last night at the restaurant. But the second half tasted just fine as lunch today. Two of the sections on their menu are called "Indiana Favorites" and "Indiana Traditions." 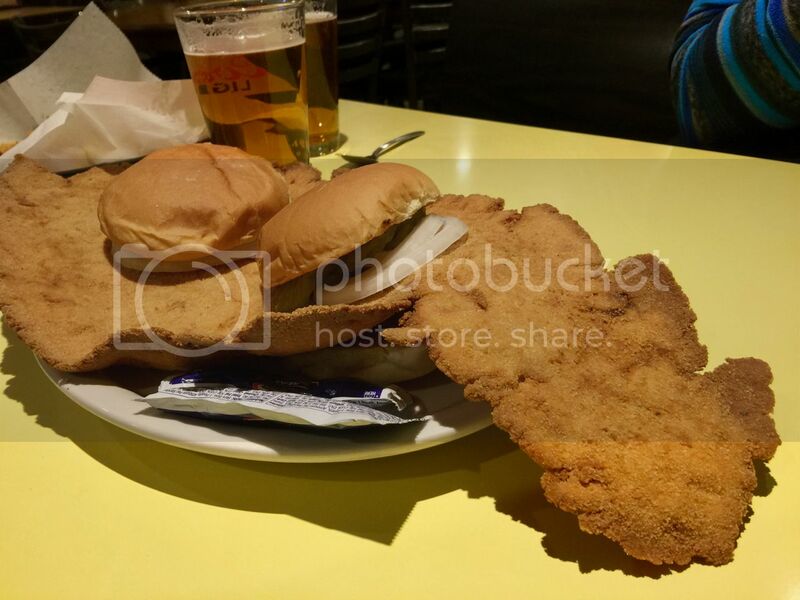 In addition to BPT and fried chicken they include Chicken Fried Steak and "O'Hare of the dog" (25 oz Budweiser & side of bacon). I'm not sure where the Indiana part comes from, they seem to have started down by San Diego and most of their restaurants are in Nevada. Indiana or not, that looks delicious! That's a fine looking sandwich! 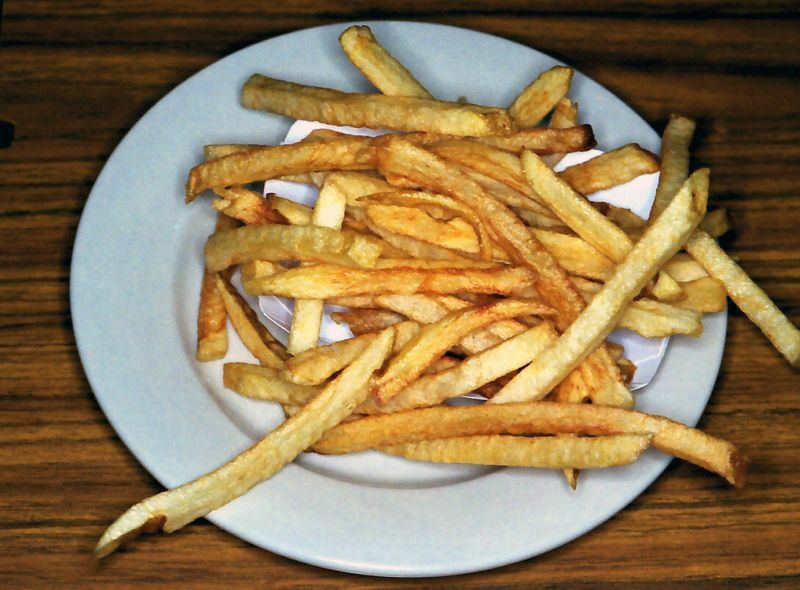 What I don't like is the sloppy drizzle of something on the plate. I do believe the original Hash House a GoGo is in Vegas. I ate there about 10 years ago and everything was delicious and the portions were gargantuan! Hash House a GoGo also has locations in Chicago, Orlando, and Plano, TX, of all places, for those unable to get a fix elsewhere. The original Hash House A Go Go was in Las Vegas on West Sahara west of the Strip by a few miles. I had my first Hash House tenderloin there. Now they have a more locations in Las Vegas. They expanded first to San Diego. Now they are all over. Arghh! a chain. They are Indiana inspired. 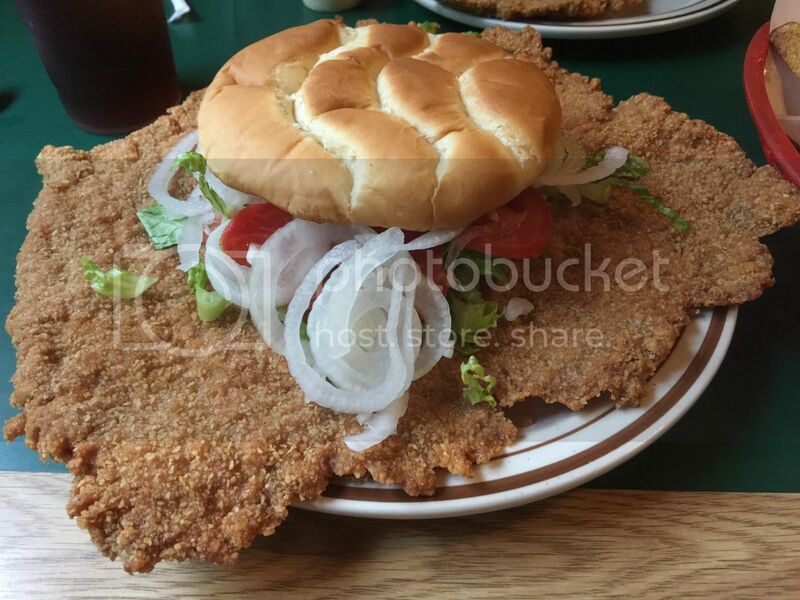 I found another Indiana inspired tenderloin at Cafe Tremolo in Tucson, AZ last week. 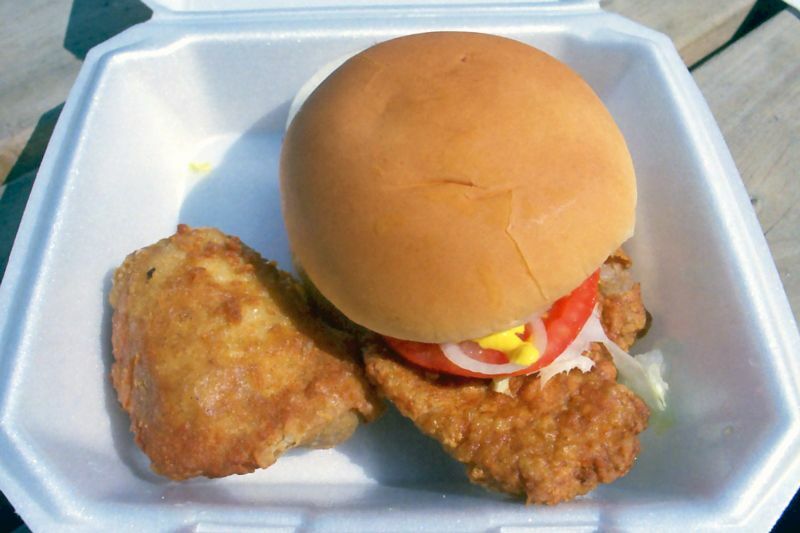 I also had a Chuckie's trailer tenderloin during a baseball spring training game in Surprise Stadium in the Phoenix area and Saturday I had another tenderloin at On the Boulevard bar in Colorado Springs, CO. I've eaten five of those. Two of them make my personal Top 5 list -- Friendly's and Nickel Plate. I've had six of them but consider the list to be more of a geographical array and Google cull sampling of other lists as some are not close to making anyone's knowledgable Top 10, 13 or 20 list in Indiana. This is why I hate lists. They interbreed feed on themselves. I only read lists to see if they use my photos without my permission, its a little pet peeve. OnlyInYourState cranks out "content" that looks like it was put together in ten minutes for ten dollars, but they get hundreds of comments and thousands of social media shares. I get my photos reposted all the time. 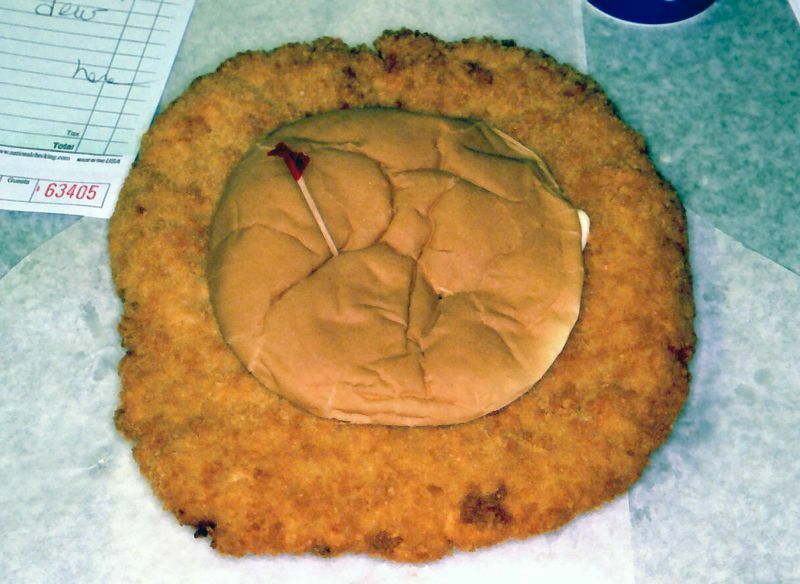 The most interesting one was the Missouri Pork Producers Association decided to copy Iowa and have a best breaded pork tenderloin sandwich competition (that lasted I think just 3 years) and used a photo of mine of a breaded pork tenderloin sandwich from the 5-8 Club restaurant in Minneapolis, MN of all places. 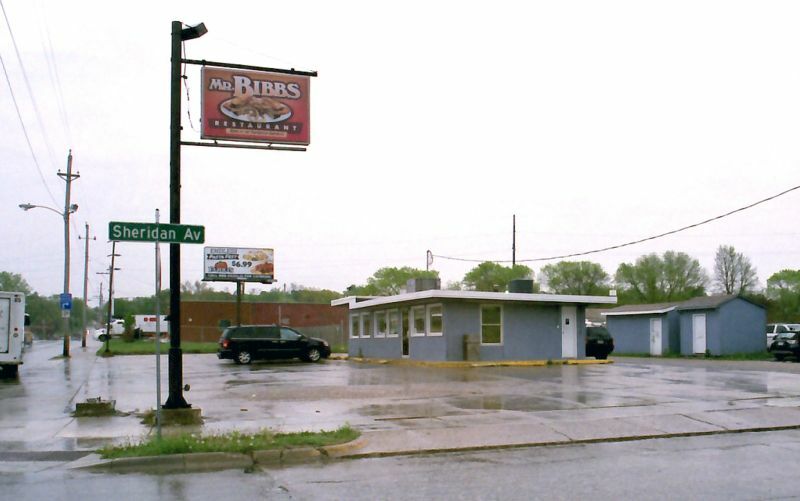 I stopped at Mr. Bibbs in Des Moines on a cold, dreary Friday a few weeks ago. It's not a large place by any means; I think there were 2 booths behind me and a 2 or 3 on the opposite wall. That's a standard size burger bun. It's not a thick tenderloin but the crust was crisp and the meat was tender and tasty. Are you not getting paid for use of your photos? 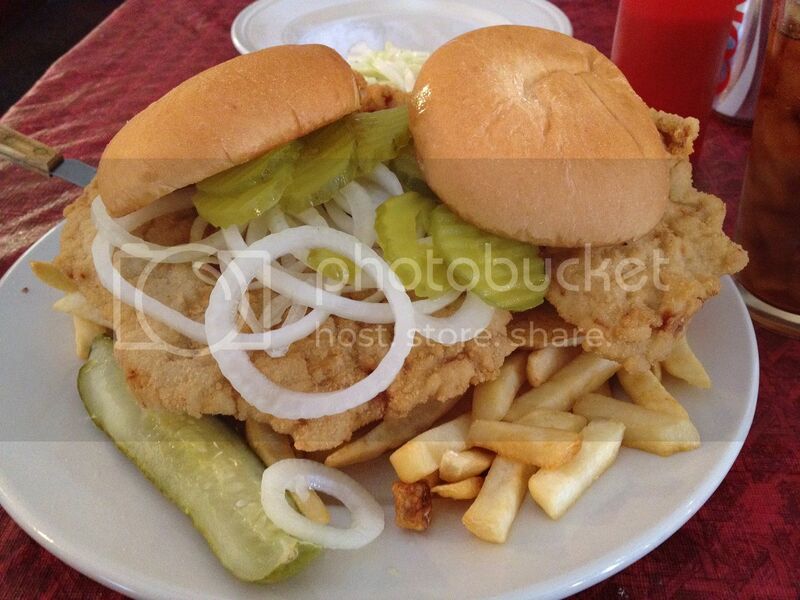 The Igloo in Peru, IL will celebrate its 80th birthday this coming July 4 and last month I stopped in to try its version of the BPT, although there it's referred to simply as "pork". As in, "I'll have a pork with fries, please." The gentleman to the right is the owner and since the restaurant wasn't very busy we were able to chat for a little bit. Very nice guy. The map on the wall is for non-locals to mark their home bases with pins. Southern WI is pretty crowded. As BPTs go The Igloo's is on the thinner side and more fritter-like, but it was a well-executed version with good crunch and flavor. However, I did order it with mayo and the taste reminded me somewhat of Miracle Whip/salad dressing, so that might be something to keep in mind. The excellent house-cut fries were a great accompaniment; I'd certainly stop again to try something different but wouldn't pass up these guys. And you shouldn't, either. No. If they are posted to the Internet they get passed around freely. I have several other examples of the abuse of my photos. I only get upset when someone takes credit for the photo (i.g. lied). 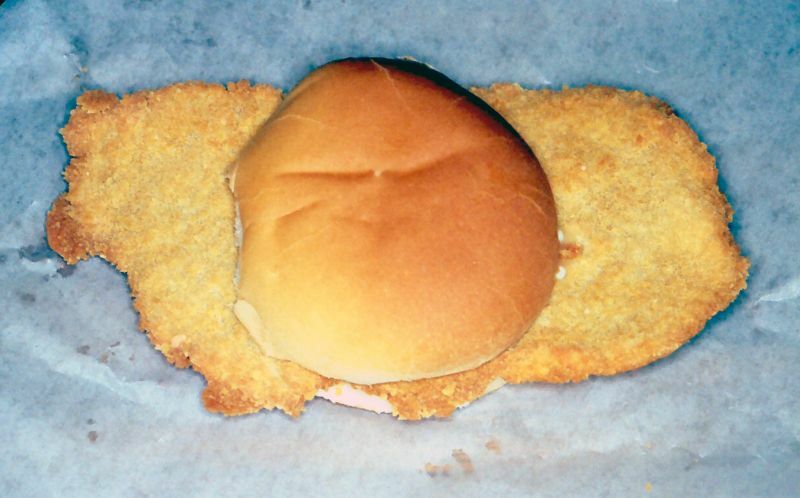 One of the best tenderloins in Illinois just ended their run. The Village Inn in Naplate, IL suffered a tornado and damaged the restaurant beyond repair. The owner's announced they will not re-open. But I discovered a new tenderloin recently in Illinois at Picco's Bar-b-cue Pit and Steakehouse in Norris, IL. No, that's a monster. Auburn, IN Town Tavern. DANG! that looks GOOD ! I was a somewhat regular of Village Grill, was actually headed there the night of tornado. Great folks running the place. 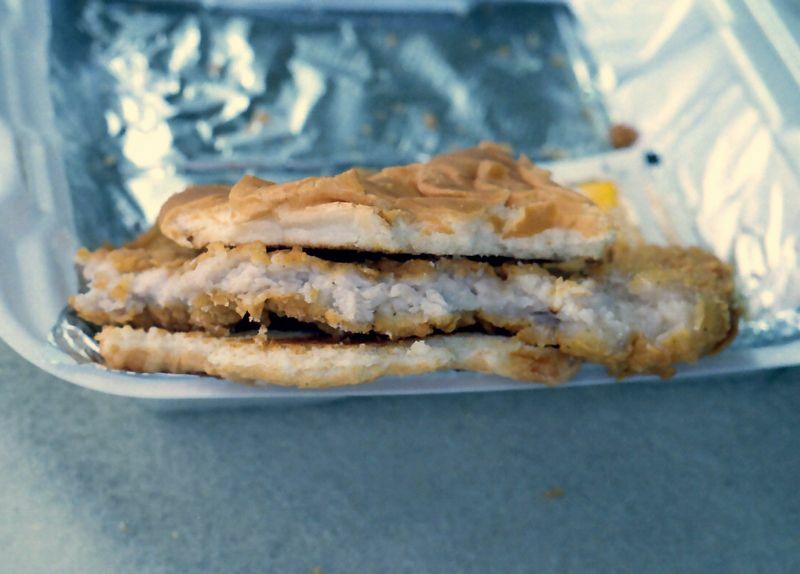 Food including tenderloin were hit or miss depending on kitchen staff. When they were on the tenderloin was top notch. 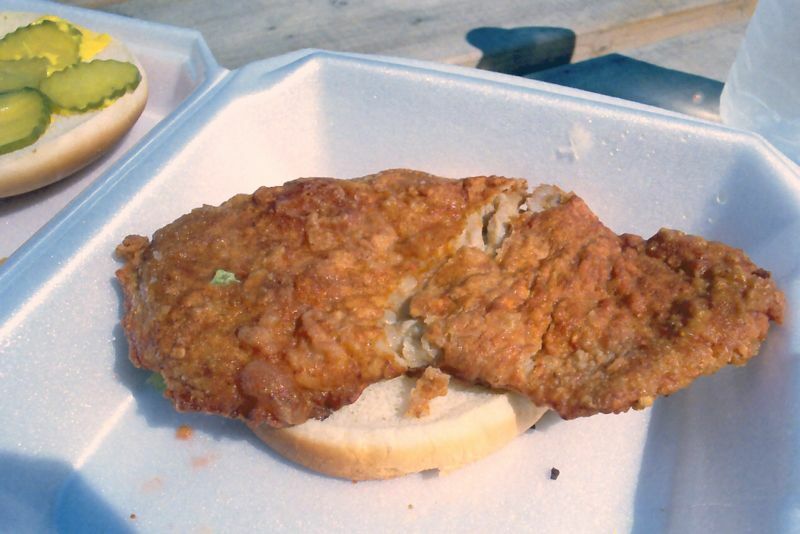 Best tenderloin in Ottawa area is probably at Wedron Office. Ymmv. Stopped in at Nick's Kitchen today. I have a Top 4 or 5 and then the rest of the BPTs just sort of slop over together into 5-15 or so. Nick's was like that the last time I had one, around 6 or 7, I just couldn't quite decide if it was Top 5 or not, and was hoping today it would make my list. Woefully, it did not. I'm not even sure it's a Top 10 for me anymore. MrsINPete had one too and described it thusly -- "the meat is so thin, it's almost unrecognizable." I thought the breading was sort of, I don't know, "hard." The toppings were OK, but you'd think in July they might have found a better tomato. So, I'm sorry for all of you that think this one's great, but it just doesn't satisfy me. I can name 10 that I like better within 15 miles of my house. No offense, I just don't think I'll be making that trip again. HOWEVER.....the PIE was absolutely out of this world!! The crust was perfect! The butterscotch was dense, the best butterscotch pie I've ever had. Stopped in at Nick's Kitchen today. I have a Top 4 or 5 and then the rest of the BPTs just sort of slop over together into 5-15 or so. Nick's was like that the last time I had one, around 6 or 7, I just couldn't quite decide if it was Top 5 or not, and was hoping today it would make my list. Woefully, it did not. I'm not even sure it's a Top 10 for me anymore. MrsINPete had one too and described it thusly -- "the meat is so thin, it's almost unrecognizable." Although I haven't eaten at Nick's I was able to sample their tenderloin a couple weeks ago at the Greensburg Tenderloin Throwdown. All of us thought it had very good flavor but that the meat was very thin. We'd all agree with your assessment and overall ranking. Sorry to report that Mr Daves in North Manchester, IN has closed due to health reasons after 50+ years. I know they used to get some good press on here for their BPT. It was a very fine one indeed. 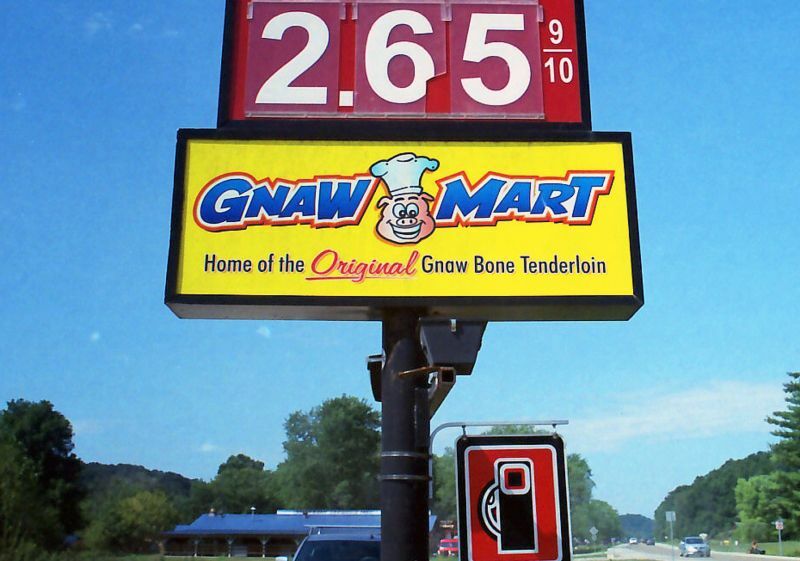 Davydd, I went down to Speedway today to sample Dawson's on Main. I'm mad at you for not taking me there at gunpoint. I've lived in Indy since 1958 and this was the first time I've been in the place. Gaaaaa! Definitely a new Top 5 for me. Good size, a bit thin, crunchy, brioche bun, great toppings -- big pickles, 2 slices of juicy summer tomato, red onion, mayo. I cut the tenderloin in half and put everything in between the halves. I got the onion rings. They were good, but just a bit greasy. Total was $16.32 with drink, tax, and tip. A bit on the pricey side, but a good adventure is always worth it. Still a few more to check out. 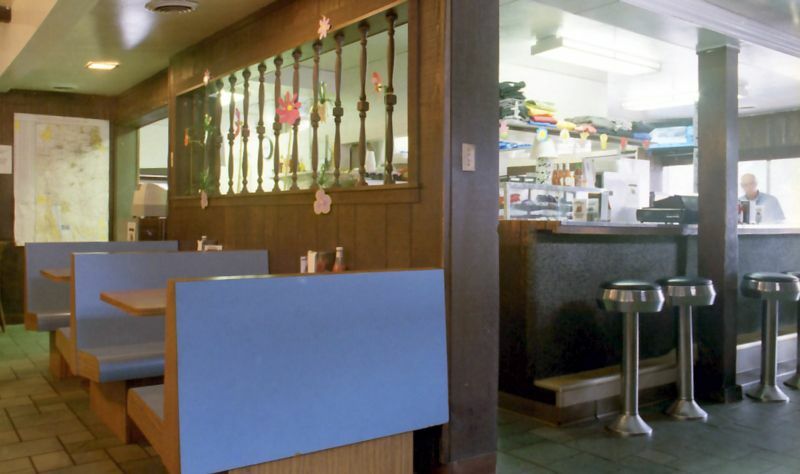 My Top 5 = Friendly's, Sahm's, Muldoon's, Dawson's, Nickel Plate. And Iowa is still on the bucket list. Next time you come down, you might try Squealer's. It's a good BBQ place, but the BPT is worth a try, definitely a Top 10. Thanks for recommending Dawson's. At the end of August I had a chance to stop here. While I'm no expert this was a darn good tenderloin, meaty with lots of flavor. And the chicken thigh was no slouch, either! I believe it was about 1pm when I stopped so it was still during lunchtime, and instead of being fried to order my lunch came out of the hot case. The tenderloin crust had softened a little bit but still had plenty of crunch, and I wonder if diners during off-peak hours get their chicken and BPTs straight from the fryer. I may have a chance to find out next year, as my annual Ohio travel plans have me spending a night at nearby Brown County State Park. I may have a chance to find out next year, as my annual Ohio travel plans have me spending a night at nearby Brown County State Park. "Meaty" is a very good description of that BPT. It's definitely an Indiana Top 10. 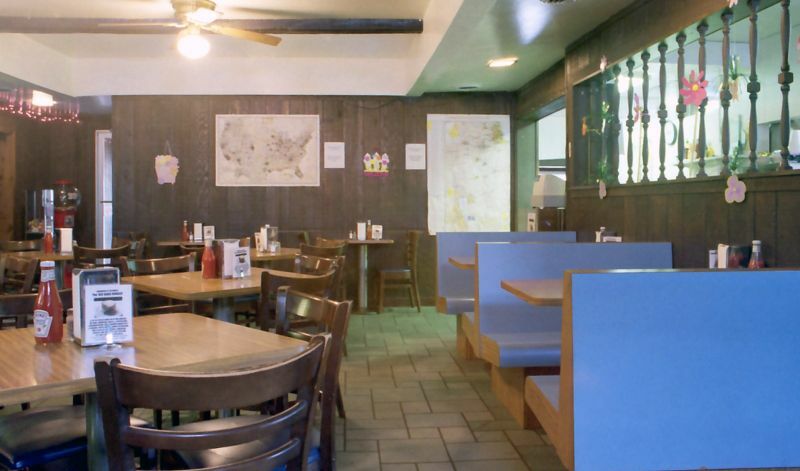 Whatever you do, DO NOT miss the Pepper Steak Soup at the Hobnob, across the street from Nashville House. And get some onion dill bread with it. You can even buy a loaf. Twice a year, Mrs. Pete and I drive the 75 minutes down there just to get soup and take home a loaf of bread. Toasted, buttered, and a generous slather of either fig or apricot preserves (available across the street at NH) is heaven. As some of you know, my job has taken me from Wisconsin to St. Louis a number of times this year and I've been using my Sunday trips down as opportunities to do some sightseeing and small-town eating, especially along the various iterations of US-66 from Bloomington to Mitchell. While I may eventually put together a trip report, one recent stop deserves mention in this thread. 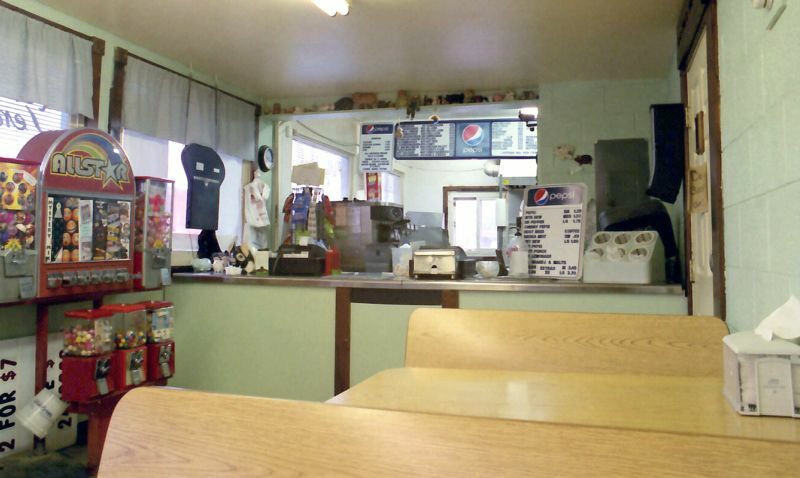 About 3 weeks ago I was truckin' (when Enterprise rents you a Ford Expedition "truckin'" is a perfectly appropriate verb) down IL-4 and decided to head east on IL-104 into the small town of Auburn to check out Ruby's Cafe. 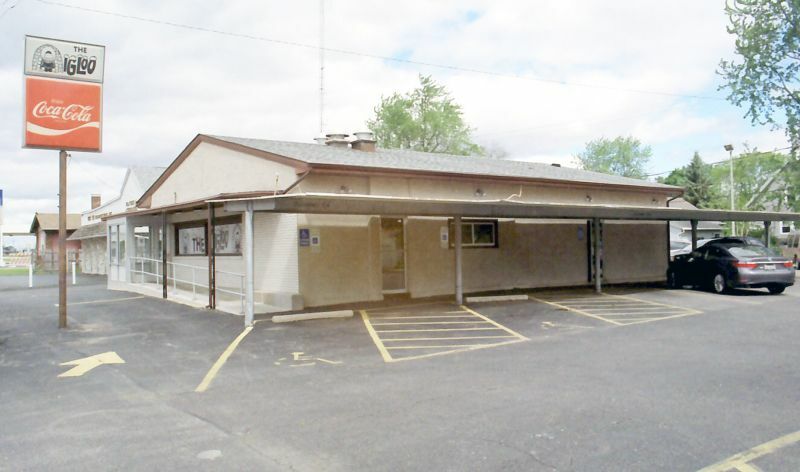 However, as it was about 1pm the parking lot and side street were full so I decided to go with Plan B, located on 104 on the western edge of town and completely unknown to me until I passed it. 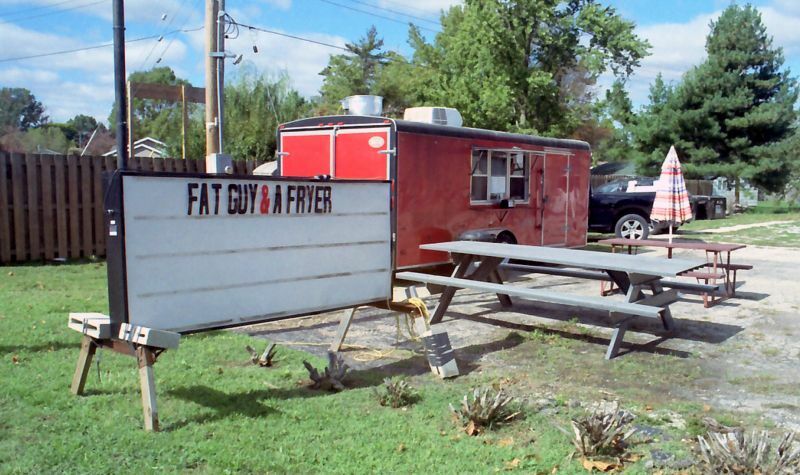 Fat Guy & A Fryer. Definitely one of the better food trailer names I've seen! 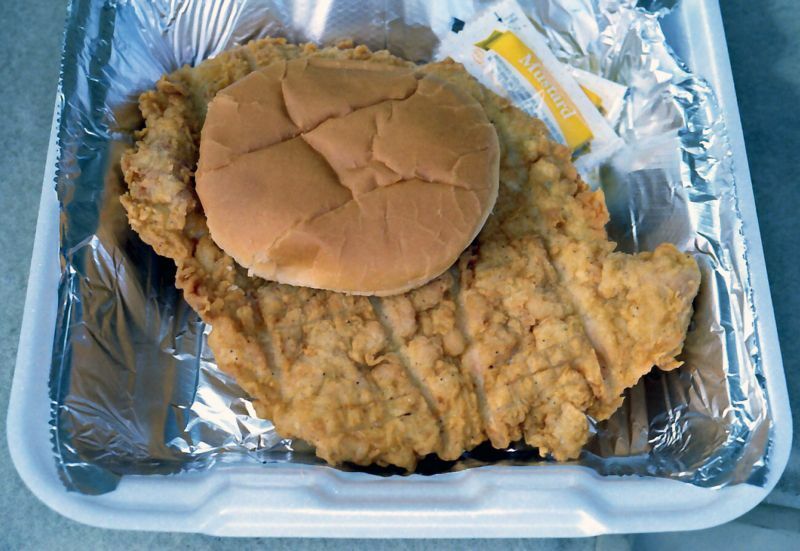 A quick check of the menu revealed an 8-ounce tenderloin (along with other goodies). Sold! Was it worth the wait? Absolutely! Mouth-burning hot (yes, I burned the roof) from the fryer, crispy, well-seasoned and delicious, this was definitely one of the best "stumble ons" I've had in a long time. And as a bonus, part of the edge even had a little bit of fat that could only be described as being akin to finding a silver dollar in a box of Crackerjack. Auburn is only 4 miles west of I-55 so exiting and heading to FG&AF should take less than 10 minutes. Order a BPT and make a pit stop at the nearby Casey's while it's being prepared! However, I failed to ask if it's a year-round operation and being a trailer it's possible he might close up during the winter.